By Design of Genesis, the third offspring of our own Belle vande Haflinger Hoev and four-time AHR ‘Stallion of the Year’ Arno van het Nieshof was shown as a weanling by Genesis Farm. ‘Dee’ has followed in the tradition of her parents and her siblings, and despite her young age has already rapidly accumulated her share of titles and awards. As a weanling at the 2007 GLHA Futurity, Dee placed 2nd in the junior weanling filly halter class. 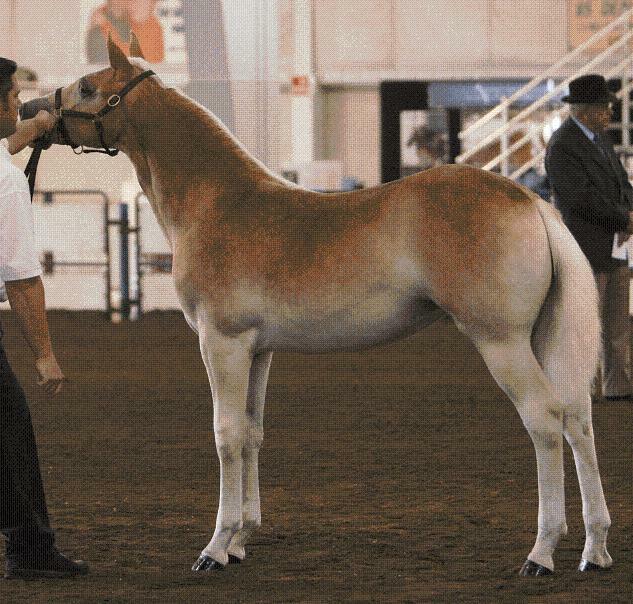 At the AHR Futurity, she won 2nd place in the junior weanling filly class and went on to win the title of Reserve Junior Champion Weanling. She won 1st place in the draft division of the Stallion Incentive Program (SIP) class, making it the second year in a row in which one of Belle’s weanling offspring won an SIP title. At the AHR National Show that same year, she won 1st place in the weanling filly halter class. Alongside her dam, Belle, she captured a 1st place at the AHR National show in the pleasure “Mare and Foal” class. Then, alongside her big sister, Britney BWS, she helped to win a 1st place in the “Produce of Dam” class for Belle and she was a part of the 1st place “Get of Sire” entry in Arno’s name. Dee was purchased by the Wiggins Family of Maple Front Farm after the 2007 show season as a future teammate for Britney, her full sister. The Wiggin’s family enjoyed a successful 2008 show season with Dee. Dee won 1st place for their farm in the yearling filly class at the 2008 AHR Futurity and later she became the 2008 AHR Futurity Champion Yearling. At the 2008 AHR National Show, Dee won the yearling filly class and earned the title of “Reserve Junior National Champion Filly”. At the GLHA Futurity later that fall, Dee was the 1st place Yearling Filly and went on to be named “Champion Yearling” at the show! Wow. The sky seemed the limit for this filly!! In the Spring of 2009, the Wiggin’s family came to the realization that Dee was not going to match her full sister, Britney, well enough for their driving hitch. At the same time, the Wiggins’ were aware of Michele’s mourning over Belle, Michele’s performance mare and Dee’s mother, who was forced into early retirement after an untimely C-section in January 2009. When the offer was made for Dee to come back to Genesis Farm, Michele sent John with the horse trailer to pick her up immediately the same day. And so it was that Dee came back to Genesis Farm. There was no shortage of hugs from Michele at this reunion between her and Belle’s daughter! We have grand plans for this incredible horse. With Dee’s sheer size, correctness, show ring presence and incredibly easy and smooth movement, all traits derived from her proven sire and dam, she will become a staple on our show string both in halter and performance arenas. Michele can hardly wait to compete with her under saddle next year. Dee was classified high silver at her AHR Inspection and Classification in July 2009 with a score of 79 points. She received a ‘9’ for her overall movement. This accumulation of points was the highest total number of points given out at any 2009 AHR Inspection. The only other horse to earn 79 points along with Dee was ‘Faith by Fire’, another filly also sired by Arno. In August 2009 at the New York Gold Classic, Dee was named “Junior Champion” and went on to be named “Reserve Best of Show” under one of the judges. In October 2009, Dee competed at the AHR Futurity in Ashland, Ohio. Michele was really looking forward to the opportunity to drive Dee in the 2-year-old pleasure driving class. They practiced together almost every night leading up to the show, driving up and down the roads around the farm. At the show, all of Michele’s hard work paid off and Dee was named pleasure ‘Champion 2-year-old’ based on her placement in the halter and the driving portion of the show. If Dee could smile, she would have had a grin on her face at least as big as Michele’s when she was handed her champion title and ribbon! Congratulations Michele and Dee! There is no doubt that Dee has and will continue to make Belle and Arno proud!